Okemah was named for Kickapoo Chief, Okemah, who lived one and one half miles east and one mile north of Harrah upon his original allotment where he died in 1936. Chief Okemah lived on the townsite of Okemah from March 1902 until a week after the opening which occurred on April 21, 1902. The agreeable and fine temperament of this old chief was really the cause of naming the town for him - noted for honesty, integrity, and uprightness - the name meaning "high man" or "person of high stature." As the hometown of folk singer, Woody Guthrie, "Okemah was one of the singiest, square dancingest, drinkingest, yellingest, preachingest, walkingest, talkingest, laughingest, cryingest, shootingest, fist fightingest, bleedingest, gamblingest, gun, club and razor carryingest of our ranch towns and farm towns, because it blossomed out into one of our first Oil Boom Towns." The Annual Woody Guthrie Free Folk Arts Festival brings thousands of music lovers and folk entertainers to Okemah for five days of good ole music lovin' fun! 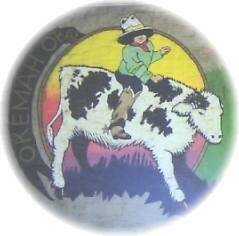 Experience Okemah with its clean, safe, friendly atmosphere. A variety of recreational and leisure activities, great schools, a strong retail environment and community spirit make Okemah a great place to visit, to raise a family, or retire. The Okemah Public Library is located in a historic rock building constructed with the aid of WPA funds. Enjoying a scenic view of Okemah's Noble Park, it is within a block of the Okemah Middle School. The Woody Guthrie Statue was dedicated at the 1998 Free Folk Festival and placed in a memorial park in downtown Okemah. Painted on a wall adjacent to the park is this mural illustrating the life of Woody done by artist, DeAnna Wilson. The county's past is explored through an early-day schoolroom display and a variety of other items, housed in a 1926 Masonic temple. The Veteran's Memorial honors those who served the United States of America in all wars with engraved emblems of the Army, Air Force, Navy, and Marine Corps.